Keywords: Depression; Allostatic load; Functional outcomes; Integrative Medicine; Complementary and Alternative Medicine. Pituitary-Adrenal (HPA) axis, and reduced allostatic stress load. The neurobiology of emotion regulation is complex and multifactorial. The brain can be conceptualized as the integration centre where information and stimuli from the physical and social world are processed and synthesized, resulting in the expression of emotion, mood and behaviour. Siegal  describes a triangle of information flow consisting of the brain or nervous system that receives signals from the outside world, the mind that processes and regulates these inputs, and relationships whereby information is shared between various regions of the brain and the body through cytokines, hormones and neurotransmitters. This overarching theoretical model proposes that all three components of the triangle are flexible and adaptive in a normal, healthy individual. However, when integration of these components is compromised, chaos and rigidity may ensue. Such might be expected to be the case in mental disorders including Major Depressive Disorder (MDD), where normal responses to stress and stimuli are impaired and processing of emotional information becomes dysfunctional. There is considerable heterogeneity between individuals in the neurobiology of well-being, with evidence suggesting individual differences in patterns of brain activity related to emotional regulation and behaviour . These individual differences are shaped both by the environment and by genetics, or “epigenetics,” and can substantially alter one’s vulnerability or resilience to stressful stimuli . However,there is also evidence to support plasticity in the neurobiological determinants of emotion, such that there exists the possibility to nurture and to cultivate positive affect . The concepts of allostasis and allostatic overload have beenextensively reviewed [3-5]. Allostasis has been defined as “a dynamic regulatory process wherein homeostatic control is maintained by an active process of adaptation during exposure to physical and behavioural stressors” whereas allostatic load has been described as the “wear and tear” of chronic stress on the body and brain, leading directly and indirectly via alterations in lifestyle and behaviours, to ill health . Mediators of allostasis can facilitate adaptation to stressful stimuli and may include health-promoting behaviours (e.g., eating a healthy diet, exercising regularly). Conversely, there are four general categories that contribute to allostatic load and overload: 1) frequent stressors to which the body usually adapts (e.g., blood pressure surges); 2) chronic stressors that the body fails to adapt to leading to persistently elevated mediators (e.g., elevations in cortisol in response to psychosocial stress); 3) failure of the body to terminate normal neuroendocrine responses to stress, leading to consistently elevated inflammatory cytokines; and 4) failure of the body to respond adequately to a challenge (e.g., post-traumatic stress leading to dysregulation of the Hypothalamus-Pituitary-Adrenal [HPA] axis) . McEwen and Gianaros  argue that interventions that are “top down” and more holistic in nature would be expected to be the most successful at alleviating allostatic overload, since they stimulate the entire body to help restore normal functioning and well-being. More integrated approaches to wellness transcend the multiple levels of behavioural habits, lifestyle, neurocircuitry and psychosocial functioning. In other words, adopting complementary approaches that may include a combination of pharmacotherapy, psychotherapy, mindfulness and spirituality, as well as diet, exercise and complementary therapies, could potentially offer depressed patients the best chance at recovering from their illness and returning to their premorbid level of wellness and functioning, although this has yet to be systematically demonstrated in the clinical trial setting. This review will attempt to integrate the concepts of the neurobiology of emotion regulation, the consequences of allostatic overload on mental and emotional functioning, and the value of a multidimensional approach to managing the complexity of depression that considers the many realms of a person’s psychosocial functioning and well-being. It will also consider the value of a more patient-centric, “functional medicine” approach whereby the underlying causes of disease are addressed using a systems-oriented approach and engaging both the patient and practitioner in a therapeutic partnership. This approach shifts the traditional disease-centred focus of medical practice to a more patient-centred approach that addresses the whole person, not just a clinical set of symptoms. Practitioners of functional medicine aim to understand the origins, prevent, and treat complex chronic diseases, including depression. The Medline (PubMed) database was searched for any combination of the following terms: “major depressive disorder”, “depression”, “psychosocial functioning”, “quality of life”, “patient-centered approach”, “complementary medicine”, “alternative medicine”, “exercise”, “physical activity”, “yoga”, “meditation”, “dietary supplement”, “nutraceuticals”, “omega-3 fatty acids”, “St. John’s wort”, “L-methylfolate”, “social network”, “stress”, “hypothalamic-pituitaryadrenal axis”, “sleep”, and “clinical trial”. Articles published in English until November 2012 were considered for this review. The reference list of identified publications was also examined for relevant literature. Studies were included in this review if they investigated the link between a specific CAM type (i.e., yoga, meditation, physical activity, nutraceuticals, or social networks) and either MDD symptoms, psychosocial functioning, stress, or sleep. Stress and cognitive dysfunction are both prevalent in clinical samples of depressed patients and may act as independent mediators of depressive illness. Both are associated with dysfunction in areas of the brain associated with information processing, emotion and affect, and may constitute promising targets for treatment of depression. Stress is prevalent in Western societies and has been associated with poor mental health and well-being. Indeed, more than 1 in 3 Canadian adults in the workforce rate their days as “quite a bit” or “extremely” stressful . 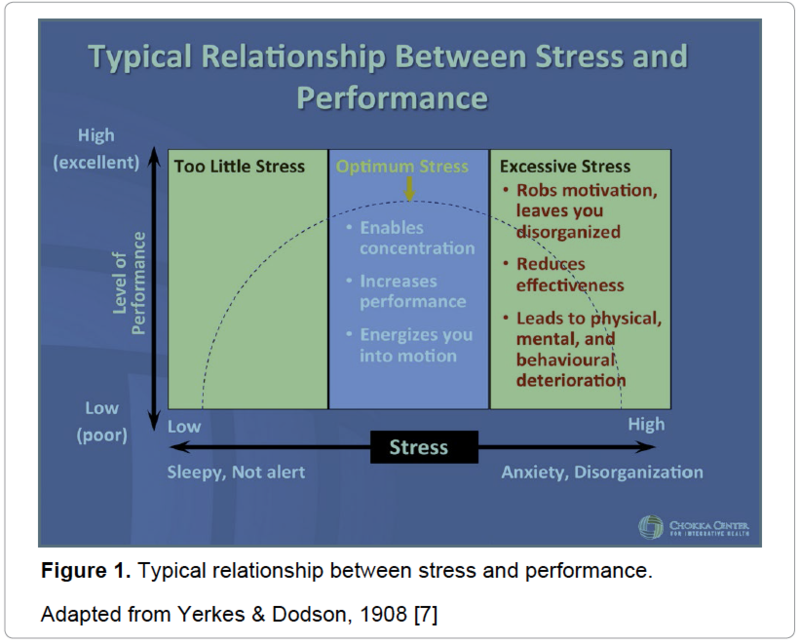 The relationship between stress and performance is best described by an inverse “U” (Figure 1) , where too little or too much stress leads to suboptimal performance. Over time, excessive levels of stress can lead to allostatic overload, resulting in physical, mental and behavioural deterioration. Figure 1. Typical relationship between stress and performance. Studies have shown that exposure to stress impairs performance on complex tasks that require flexibility (i.e., tasks that involve the prefrontal cortex [PFC]) . Exposure to stress has been shown to alter brain neurocircuitry and cause structural remodelling in the PFC, hippocampus, and amygdala, which are implicated in mood and cognitive function (e.g., memory, selective attention and, executive function) [4,8]. The PFC is involved in higher-order executive functioning, including decision-making, planning and emotion regulation. The ventromedial prefrontal cortex (VmPFC) is densely connected to the amygdala and other subcortical structures. During stressful situations, the amygdala activates stress pathways, leading to release of the neurotransmitters, noradrenalin and dopamine. While these further strengthen activation of the amygdala, they impair the function of the PFC resulting in fear conditioning. Thus, during stressful conditions, control is shifted from the higher-order behaviour regulator (the PFC) to more primitive brain structures (the amygdala). In animal models, chronic stress and allostatic overload have been shown to impair learning and decision-making, and have been accompanied by higher levels of anxiety and aggression . Psychosocial stress has been identified as a precipitating factor for psychological distress in humans . A meta-analysis of studies evaluating the pathophysiology of depression has implicated several areas of the brain . Compared to healthy controls, patients with MDD were found to have increased activity at rest in the VmPFC, lateral orbital PFC, amygdala, thalamus, and caudate, and decreased activity in the dorsolateral PFC, insula, pregenual and dorsal anterior cingulated cortex, as well as the superior temporal gyrus. Several studies suggest that hippocampal volume is reduced in patients with MDD [11-14], though some studies show reduction only in the left, and not the right, hippocampus [15,16]. Others failed to show a reduction in hippocampal volume in depressed vs. non-depressed subjects . Structural changes in the amygdala have also been documented, with increased volume characterizing the acute state in the early  but not later course of depression . Patients with active and remitted MDD have been shown to have elevated morning and evening cortisol levels compared to healthy controls, suggesting a hyperactive Hypothalamic-Pituitary-Adrenal (HPA) axis, a major biological mediator of stress [20,21]. related to processing speed, attention, executive function, learning and memory; and 2) cognitive bias whereby attention is favoured towards negative stimuli and negative interpretation of information [24-26]. Several domains of cognitive function are impaired in depressed patients, including information processing speed , memory , verbal recall and recognition [29,30], as well as non-verbal memory and organizational strategies during learning . Importantly, executive function remains impaired in both younger and older patients with depression even after symptomatic remission . Dysfunction in these cognitive domains has been shown to correlate with psychosocial functioning . Evidence also suggests that depression is a risk factor for cognitive dysfunction and dementia, supporting a circular link between cognition and depression . Major Depressive Disorder (MDD) is recognized as one of the leading causes of global disease burden. It is one of the most prevalent mental health conditions affecting an estimated 1 in 10 adults over the course of their lifetime . The condition has been associated with major functional impairments for patients and decreased overall quality of life [36-38]. A pharmacotherapeutic approach is the foundation of treatment of most cases of moderate to severe depression . Yet real-world studies suggest that only 1 in 3 patients achieve remission with a first-line antidepressant, leaving a substantial proportion of patients with clinical depression . Moreover, many patients who achieve remission still report residual symptoms that interfere with their psychosocial functioning  and do not consider themselves to be recovered . Why isn’t functional recovery the primary endpoint in MDD trials? In clinical trials, remission is usually defined according to scores on standardized symptom severity scales, such as the Montgomery-Asberg Depression Rating Scale (MADRS)  or the Hamilton Rating Scale for Depression (HAM-D) . However, this narrow symptomatic definition is often too limited to encompass the complexity of MDD. For instance, in addition to symptom severity, functional impairment and quality of life are also significant and independent predictors of remission . Moreover, the traditional clinical definition of remission is not always aligned with patient perceptions of remission. Indeed, patients rated positive mental health (e.g., optimism, selfconfidence), return to “normal self,” and return to usual level of functioning as the most important features of remission . Yet only 5% of clinical trials evaluating the treatment of MDD have reported on functional measures at all, and usually as secondary (i.e., underpowered) endpoints . This is somewhat surprising, given that MDD has been associated with significant disability on several functioning and quality of life scales, including the Quality of Life Enjoyment and Satisfaction Scale, the 12-item Short-Form Health Survey (SF-36), the Work and Social Adjustment Scale [38,48,49] and others. While scores on symptomatic and functional rating scales are undeniably related, it is increasingly recognized that these correlations are imperfect and discordance has been described. For instance, some patients who achieved clinical remission still reported substantial functional limitations [41,47,50]. For clinicians, there is a lack of available information to guide evidence-based decisions for targeting residual symptoms associated with functional impairments in MDD. Consequently, notwithstanding the need to report psychosocial functioning data in clinical trials, there is also an unmet need to develop a concise and standardized measure of global functioning that can also be used in the clinical practice setting, and to validate it in MDD populations . A key limitation in this evolving field is the lack of expert consensus on the most appropriate scale to assess functional measures in MDD, which makes it challenging to compare research and apply findings in clinical practice. The term “functioning” as it relates to depression typically refers to the objective or subjective assessment of performance in one or more behavioural domains, including occupational, social, family and physical functioning. Given the multidimensional nature of functioning, it intuitively makes sense that a multipronged approach would be needed to optimize diverse domains of functioning. A patient-centric, integrated approach to the treatment of MDD that includes a tailored combination of pharmacotherapy, psychotherapy and one or more alternative therapies may be needed in order to achieve functional recovery in depressed patients. Furthermore, it is likely that improvements in measures of functioning are mediated through both biological and psychosocial variables including stress, sleep and social support networks, such that these should also represent targets of treatment approaches. Antidepressants are a mainstay of the management of moderate to severe depression. They are recommended as a first-line treatment strategy for patients with MDD , alone or in combination with psychotherapy. These recommendations are based on studies demonstrating that antidepressant treatments can reduce objective measures of depressive symptoms. Some antidepressants have been shown to improve measures of psychosocial functioning [52-55], with some evidence supporting differential effects for individual agents in terms of functional outcomes even when symptomatic outcomes were equivalent . From a neurobiological perspective, animal studies suggest that antidepressants may have an effect in recruiting new neurons and improving stress response regulation through hippocampal neurogenesis . Indeed, Selective Serotonin Reuptake Inhibitors (SSRIs) were shown to restore hippocampal regulation of the HPA axis under chronic stress conditions in an animal model, providing a mechanistic framework for recovery in depression. It could therefore be hypothesized that antidepressants may help integrate brain regions that are impaired in depression. This hypothesis remains to be tested in humans. Cognitive Behaviour Therapy (CBT) has been extensively studied in patients with MDD and is recommended as a first-line treatment approach alone or in combination with pharmacotherapy . This form of psychotherapy can help address the cognitive bias towards negative interpretation of information. The use of CBT has been supported in several reports in adolescents , adults [59,60] and in the elderly [61,62]. Serfaty et al. reported improvements on the Beck Depression Inventory-II (BDI-II), but not on the Social Functioning Questionnaire. Similarly, Gould et al. reported a greater effect of CBT on clinician-rated outcomes than patient-reported outcomes, and argued for the inclusion of both types of measures in randomized controlled trials and meta-analyses when evaluating the efficacy of CBT. An internet-based CBT intervention showed beneficial effects in both depressive symptoms (Beck Depression Inventory [BDI]) and social functioning (Work and Social Adjustment Scale) . CBT and antidepressants probably exert shared as well as distinct effects on limbic and prefrontal neurocircuitry . There is evidence that the combination of antidepressant plus CBT is more effective than antidepressant alone on depressive symptoms [58,59,61,65]. Mindfulness-based Cognitive Therapy (MBCT) is similar to CBT but adds dimensions of mindfulness and meditation. It has been shown to be an effective treatment for MDD  and for treating residual symptoms of depression . MBCT is often used as a strategy to prevent relapse or recurrence of depression. Indeed, a study by Segal and colleagues  suggests a stepwise approach where patients who achieve symptomatic remission with pharmacotherapy can maintain wellness equally with a subsequent course of MCBT or continuation pharmacotherapy; either form of maintenance treatment was significantly better than placebo in preventing relapse. There is growing interest among patients and caregivers in nontraditional treatments for depression and other illnesses. Alternative medicine includes a wide range of health care practices, products and therapies such as acupuncture, chiropractic, and naturopathy. Complementary medicine describes the use of alternative medicine as an adjunct to traditional medical approaches. An emerging term is “integrative medicine,” which describes the combination of alternative approaches with evidence-based medicine . The use of Complementary and Alternative Medicine (CAM) in the treatment of MDD is a common phenomenon and is often unsupervised by the treating physician. Up to 54% of patients report the use of alternative therapies such as yoga/meditation, exercise, dietary supplements, and participation in support groups [70,71]. Many CAM approaches to the management of depression share the ability to decrease stress levels and therefore potentially improve daily functioning. Preliminary evidence has linked yoga, meditation and exercise with stress reduction. For instance, a significant decrease in the “feeling of stress” and “trait anxiety” was reported following an Ashtanga yoga intervention  and meditation . In rat models of stress, exercise was associated with decreased serum cortisol levels and improved depression-related behaviours (e.g., sucrose consumption test) [74,75]. Improved HPA axis regulation was the alleged mechanism of action for these clinical improvements, which have been evaluated in humans in response to yoga  and exercise [77-79]. Yoga, meditation and exercise may also exert beneficial effects on cognitive domains that are often impaired in depression, including executive function and memory [80,81]. In summary, it is plausible that the beneficial outcomes of CAM approaches on depressive symptoms and psychosocial functioning may be mediated by a reduction in stress levels and cognitive dysfunction, but larger scale Randomized Controlled Trials (RCTs) must be conducted, and specific mechanisms elucidated to strengthen this hypothesis. Acknowledging the prevalent use of CAM by patients with depression, the Canadian Network for Mood and Anxiety Treatments (CANMAT) published recommendations endorsing the use of some types of CAM for the management of MDD in adults  and endorsed the inclusion of CAM into the mainstream management of the disorder. CAM should, in most cases, be considered an adjunctive strategy used in combination with evidence-based first-line therapies (i.e., pharmacotherapy and/or psychotherapy). Indeed, CANMAT stated that “recommendations must be customized within the context of an individual patient and should not be considered as standards of care.” . Table 1 outlines some of the CANMAT’s recommendations for CAM in the management of MDD; notably, these recommendations are based on studies evaluating symptomatic outcomes and there continues to be a dearth of information describing their effects on functional outcomes. Yoga and meditation are among the most popular and well researched alternative therapies for MDD. Yoga is an ancient practice that integrates physical postures, breathing exercises and/or meditation. In a small, 2-month RCT evaluating the effects of yoga in addition to conventional antidepressants in patients with MDD (n=15), yoga plus conventional antidepressants significantly reduced symptomatic scores on the Hamilton Anxiety Rating (HAM-A) and HAM-D scales . In one of the few studies reporting on functional measures, Shahidi et al. showed that laughter yoga induced significant improvements in depression symptoms (Geriatric Depression Scale) as well as quality of life (Life Satisfaction Scale) in elderly depressed women compared to a control group; a limitation of this study is that the use of concomitant medications was not reported. From a mindbody perspective, yogic breathing (specifically, Sudarshan Kriya Yoga [SKY]) has been shown to increase parasympathic drive, reduce stress response systems including neuroendocrine release of hormones, and HPA axis activation . Despite these promising findings, there is a need for more rigorous trials evaluating yoga in MDD patients, especially evaluating its potential impact on measures of psychosocial functioning. Moreover, it is likely that negative findings are seldom reported in the literature, therefore the true magnitude of effect of yoga on depression remains elusive. Similar to yoga, only a few RCTs of moderately high quality have investigated the effects of meditation in patients with MDD. A 28- week meditation intervention in patients with adjustment disorder with mixed anxiety and depression reported benefits in both control and intervention groups, but a significantly larger improvement was noted on both symptomatic (Clinical Global Impression – Severity [CGI-S], CGI-Improvement [CGI-I], and BDI) and functioning scales (Global Assessment of Functioning [GAF]) . Over a longer follow-up period, an open label meditation intervention targeted at stress reduction decreased scores on HAM-A, HAM-D and BDI scales at 3-month and 3-year follow-up . Neuroimaging studies suggest that long-term meditators have differences in cortical features that may explain the effects of meditation on emotion and behaviour . A recent pilot study showed that brief daily yogic meditation reduced depressive symptoms and increased performance on cognitive tests in family dementia caregivers . It remains to be shown whether meditation practices might exert beneficial effects on cognitive domains that are negatively affected by depression, such as executive function, processing speed and memory. Table 1. CANMAT recommendations for selected CAM therapies for the treatment of major depressive disorder (MDD). There is emerging evidence supporting a relationship between religion or spirituality and improved outcomes in depressed patients, particularly in older adults . Individuals who report that religion or spirituality is important to them  and those who attend worship services once a month or more  appear to have a lower risk of developing MDD compared to those who do not. These associations appear to be greatest for preventing recurrence of depression rather than new onset depression. Kasen et al. propose that religiosity might contribute to the development of resilience in people at high risk of depression (e.g., those with strong family history of depressive disorders). The practice of “centering prayer” or contemplative prayer is a form of meditation strongly emphasizing interior silence. It generally involves sitting comfortably and quietly and choosing a sacred word that best supports one’s sincere intention to be in the Lord’s presence. As the mind wanders, practitioners of centering prayer return their thoughts to their chosen sacred word as a way of “centering” their meditation. Centering prayer has been shown to be beneficial at alleviating stress in women undergoing chemotherapy  but also as a way to alleviate every day stress . Physical activity is one of the CAMs that is the best supported by evidence; however, important methodological limitations must be taken into account including difficulties with subject blinding, diversity of mode and intensity of exercise programs, clinical population heterogeneity, and varying duration of interventions and follow-up. Several meta-analyses have reported mild-to-moderate beneficial effects of exercise on depressive symptoms compared to control [95-97]. However, the effects of exercise were less robust in the larger, well-controlled trials included in the meta-analyses. In a more recent, well-controlled, large (n=2,322) clinical trial, Blumenthal and colleagues  reported modest but significant improvement in depressive symptoms (BDI-II) following a 1-year aerobic exercise program in depressed patients with coronary heart failure compared to usual care. At least two studies directly comparing exercise training to antidepressant therapy suggest that exercise is at least as effective as pharmacotherapy for the treatment of MDD  or in patients with coronary heart disease and depressive symptoms . In several smaller clinical trials, exercise has been demonstrated to be effective as an adjunct to standard pharmacotherapy and/or in patients with initial suboptimal response to antidepressants [101-103]. Adjunctive tai chi was shown to augment the antidepressant effects of an SSRI in older adults with depression . Notably, subjects in the tai chi plus SSRI group also showed significantly greater improvements in physical functioning and cognitive tests. A 4-month strength training program resulted in fewer absences from work compared to aerobic exercise and relaxation groups . It is interesting to note that this trial did not find a beneficial effect of exercise on traditional symptomatic rating scales but did report superiority of exercise on measures of psychosocial functioning. Consequently, it is possible that the effects of exercise in patients with MDD may be more robust on measures of functioning and quality of life and this merits further investigation. Several cross-sectional, observational studies support an association between consumption of a healthy diet rich in fruits and vegetables, and prevention of depression and anxiety [105-107]. Only a few studies have prospectively evaluated the impact of diet on the incidence of depression. One prospective observational study, the Seguimiento Universidad de Navarra (SUN) Project, followed more than 10,000 university graduates in Spain for a median of 6 years and found that eating a Mediterranean diet favouring omega-3 fatty acids and olive oil, was protective against depression . Conversely, a Western diet high in trans fatty acids, fast food and bakery products was associated with higher rates of depression in both the SUN Project and in a longitudinal, prospective British cohort study . The Spanish group went on to show in a RCT that consumption of a Mediterranean diet was associated with higher levels of Plasma Brain-Derived Neurotrophic Factor (BDNF), providing a potential mechanism for the protective effects of a healthy diet on risk of depression . In support of these observational studies, the Spanish group compared the effects of a Mediterranean diet versus a low-fat diet on depression risk in a randomized primary prevention trial of older men and women at high risk of cardiovascular disease . There was a strong trend towards protection against the development of depression in participants assigned to a Mediterranean diet with nuts (multivariate HR 0.78, 95% CI 0.55 to 1.10) compared to the control group. This association became significant when the analysis was restricted to participants with type 2 diabetes. [119,120]. Emerging evidence also supports a role for L-methylfolate supplementation as an adjunct to SSRIs . There is conflicting evidence surrounding the benefits of vitamin D supplementation, where some studies  but not all , suggest that vitamin D could be a useful adjunct to SSRI treatment of MDD. Suboptimal dosing of vitamin D (i.e., 400 IU/day) may have accounted for the negative findings. Finally, there is some evidence supporting the role of a daily multivitamin on mood and stress in nonclinical samples [124,125], but it remains unclear what, if any, role a multivitamin has in mediating psychosocial functioning in patients with clinical depression. Social support networks are important determinants of depression and, consequently, it has been hypothesized that using positive social support may be an important factor in reaching remission and functional recovery in MDD. In the Framingham cohort, scores on the Center for Epidemiological Studies Depression Scale (CES-D) were significantly correlated with scores related to friends and neighbours, with such associations being stronger in women . People’s happiness has also been shown to correlate with the happiness of those with whom they are connected . Furthermore, social support was correlated with depression symptom severity in both men and women . From a psychosocial functioning perspective, unsatisfactory relationships within a patient’s support system predicted below normal functioning and a higher rate of relapse in a cohort of inpatients with MDD . A brief loving-kindness meditation intervention program was shown to increase healthy participants’ (non-clinical sample) sense of social connection and reduced feelings of social isolation . Given the strong associations between optimal social support, depressive symptoms and level of functioning, using social networks as a therapeutic approach to managing depression represents an interesting area for further research. A recent meta-analysis examined the effects of personalised support services in patients with severe and persistent mental illness (not specific to depression) and reported moderate strength for reducing illness symptoms and weak strength for improving everyday functioning . In this analysis, personalised support was defined as one-on-one interaction from a health professional (non-clinician) to a person with mental illness. Using online social support may constitute another avenue to enhance the quality of patients’ interpersonal relationships, and therefore improve depressive symptoms and/or psychosocial functioning. An ongoing RCT is investigating the use of an Internet-based, peer-topeer support group in patients with elevated psychological distress with assessment of both depressive symptoms and measures of psychosocial functioning . Using social networks as an adjunctive therapy for patients with depression is an interesting theoretical avenue, but there is currently a lack of clinical evidence on both depression symptoms and functional measures. Numerous factors, such as the quality of the support system, severity of depression, and length and intensity of the intervention, would likely influence clinical outcomes. Finally, there is a growing body of evidence supporting the role of “positive psychology” interventions for managing patients with depression. These include counting blessings, practicing kindness, personal goal-setting, expressing gratitude and acknowledging personal strengths. A recent meta-analysis of 39 studies supports the efficacy of positive psychology interventions in clinical populations, with small to medium effect sizes (0.20 for psychological well-being, 0.23 for depressive symptoms and 0.34 for subjective well-being) . It remains to be seen what effects these types of interventions can have on measures of psychosocial functioning. Fostering a strong therapeutic alliance between patient and healthcare provider is an important nonpharmacological aspect of MDD management strategies. The therapeutic alliance is based on a foundation of trust, respect, genuineness, unconditional positive regard and empathy . Building an effective therapeutic alliance involves engaging the patient in decisions on the desired outcomes of therapy and the steps that will be taken to achieve the identified goals, and working together to achieve agreed-upon goals. Some of the benefits of a strong patient-physician partnership include greater adherence to treatment , greater patient autonomy, increased patient satisfaction, and better depression outcomes . Importantly, evidence suggests that shared decision-making does not pose an unrealistic burden on the healthcare provider. Indeed, office visits were not shown to be longer when a shared decision-making approach was adopted versus usual care . 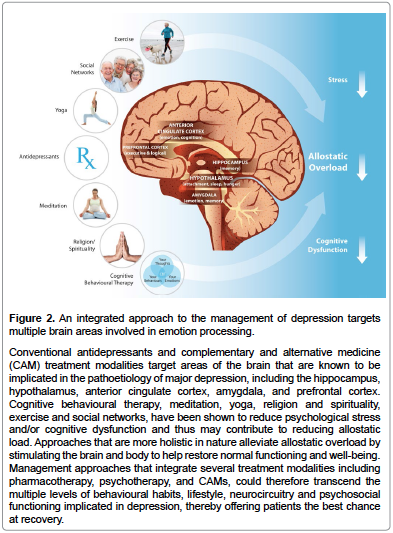 Considering the wide range of alternative treatments that have shown promising results in combination with pharmacotherapy for patients with MDD, there is a movement towards management strategies that encompass more integrated and holistic approaches to the treatment of depressed patients. While this remains an evolving area of research interest, some preliminary findings offer reason to be encouraged. For example, a home-visit intervention that included a person-centric approach was shown to reduce the proportion of postnatal women with scores equal to or above 12 on the Edinburg Postnatal Depression Scale . Similarly, patient-oriented and culturally appropriate interventions were as effective as standard care in a group of African-American women in terms of improving symptoms and functioning, but patient-centric care resulted in better quality ratings of care . In an observational study, the ratings of “patientcenteredness” in patient-physician interactions were significantly correlated with patients’ improvement on the 9-item Patient Health Questionnaire (PHQ-9) . Most of these interventions use patient-centric approaches involving a single health care provider (e.g., interaction between the patient and a nurse or a general practitioner). Using integrated, patient-centric interventions involving multidisciplinary healthcare providers may offer even further benefit in terms of symptomatic remission and functional recovery from MDD. In this way, all three components of Siegal’s triangle of information processing  – namely the brain, the mind, and relationships – could be simultaneously targeted (Figure 2). Specifically addressing the key components of mental and psychological well-being via different and complementary mechanisms should offer the best hope for depressed patients to achieve recovery and wellness. While the potential benefits of an integrated approach to the management of depression are increasingly recognized, there are barriers that prevent its uptake by primary care physicians and psychiatrists. These include lack of robust data supporting the use of CAM approaches in depression; lack of awareness and skills in using and applying CAM approaches, meditation, and principles of positive psychology; lack of coordinated services between different health care practitioners resulting in a “piecemeal” delivery of patient care; access and cost of nonpharmacologic treatments including CBT, mindfulness, yoga, exercise, nutrition, etc. ; and lack of time to deliver nonpharmacologic treatments [82,141]. Physicians would benefit from “hands on” exposure to education and training on using an integrated approach to management of depression, including the use of CAM. Such educational initiatives should commence early in a physician’s training and progress through various levels of training and clinical experience. The development of “centers of excellence” where such shared and coordinated care is being practiced could help advance the care of patients with depression by training future practitioners in a more integrated approach. There is an ongoing, unmet need to consistently assess measures of functioning in depressed patients in both the research and clinical settings. Routinely including symptomatic and functioning scales may help identify limitations of patients’ current treatment regimens, especially regarding psychosocial functioning and quality of life. While antidepressant treatment and psychotherapy, alone or in combination, remain the cornerstones of MDD treatment, it is important to consider integrated, patient-centric approaches that may enhance treatment outcomes and help patients achieve full functional recovery. There is an expanding body of evidence supporting the use of complementary and alternative approaches, such as yoga/meditation, spirituality/religiosity, exercise, dietary supplements, and social support as adjunctive therapeutic measures that enhance response to conventional treatments. Some of the common mechanisms of action of CAMs may reside in improved HPA axis regulation and a consequent reduction in allostatic stress load and/or structural changes in brain areas; while this remains to be elucidated in well-designed studies, it remains a testable hypothesis. Important methodological limitations and considerable heterogeneity in intervention designs limit the strength of the conclusions that can currently be drawn from existing studies evaluating CAM. Finally, future RCTs in this field should be powered to detect effects on both depressive symptoms and measures of functioning, which will improve clinicians’ ability to make evidencebased decisions in the integrated management of patients with MDD. editorial and submission support for this manuscript. Interact and Shape Who We Are (2ndedn). The Guildford Press, New York, NY. biobehavioural correlates. Philos Trans R Soc Lond B Biol Sci 359: 1395-1411. 4. McEwen BS (2006) Protective and damaging effects of stress mediators: central role of the brain. Dialogues Clin Neurosci 8: 367-381. 5. McEwen BS (2007) Physiology and neurobiology of stress and adaptation: central role of the brain. Physiol Rev 87: 873-904. 6. Statistics Canada. Canadian Community Health Survey “Mental health and wellbeing survey”, 2002. 7. Yerkes RM, Dodson JD (1908) The relation of strength of stimulus to rapidity of habit-formation. J Compar Neurol Psychol 18: 459-482. 8. Arnsten AF (2009) Stress signalling pathways that impair prefrontal cortex structure and function. Nat Rev Neurosci 10: 410-422. 9. aan het Rot M, Mathew SJ, Charney DS (2009) Neurobiological mechanisms in major depressive disorder. CMAJ 180: 305-313. 10. Fitzgerald PB, Laird AR, Maller J, Daskalakis ZJ (2008) A meta-analytic study of changes in brain activation in depression. Hum Brain Mapp 29: 683-695. 12. Sheline YI, Sanghavi M, Mintun MA, Gado MH (1999) Depression duration but not age predicts hippocampal volume loss in medically healthy women with recurrent major depression. J Neurosci 19: 5034-5043. Hippocampal volume in geriatric depression. Biol Psychiatry 48: 301-309. 14. Hänsel A, von Känel R (2008) The ventro-medial prefrontal cortex: a major link between the autonomic nervous system, regulation of emotion, and stress reactivity? Biopsychosoc Med 2: 21. 15. Bremner JD (2002) Structural changes in the brain in depression and relationship to symptom recurrence. CNS Spectr 7: 129-130, 135-9. 16. Mervaala E, Föhr J, Könönen M, Valkonen-Korhonen M, Vainio P, et al. (2000) Quantitative MRI of the hippocampus and amygdala in severe depression. 17. Vakili K, Pillay SS, Lafer B, Fava M, Renshaw PF, et al. (2000) Hippocampal volume in primary unipolar major depression: a magnetic resonance imaging study. Biol Psychiatry 47: 1087-1090. 18. van Eijndhoven P, van Wingen G, van Oijen K, Rijpkema M, Goraj B, et al. (2009) Amygdala volume marks the acute state in the early course of depression. Biol Psychiatry 65: 812-818. 19. Kronenberg G, Tebartz van Elst L, Regen F, Deuschle M, Heuser I, et al. (2009) Reduced amygdala volume in newly admitted psychiatric in-patients with unipolar major depression. J Psychiatr Res 43: 1112-1117. 20. Lok A, Mocking RJ, Ruhé HG, Visser I, Koeter MW, et al. (2012) Longitudinal hypothalamic-pituitary-adrenal axis trait and state effects in recurrent depression. Psychoneuroendocrinology 37: 892-902. Major depressive disorder and hypothalamic-pituitary-adrenal axis activity: results from a large cohort study. Arch Gen Psychiatry 66: 617-626. 22. Fava M (2003) Symptoms of fatigue and cognitive/executive dysfunction in major depressive disorder before and after antidepressant treatment. J Clin Psychiatry 64 Suppl 14: 30-34. 23. Conradi HJ, Ormel J, de Jonge P (2011) Presence of individual (residual) symptoms during depressive episodes and periods of remission: a 3-year prospective study. Psychol Med 41: 1165-1174. 24. Hasselbalch BJ, Knorr U, Hasselbalch SG, Gade A, Kessing LV (2012) Cognitive deficits in the remitted state of unipolar depressive disorder. Neuropsychology 26: 642-651. 25. Disner SG, Beevers CG, Haigh EA, Beck AT (2011) Neural mechanisms of the cognitive model of depression. Nat Rev Neurosci 12: 467-477. Cognitive dysfunction in depression: neurocircuitry and new therapeutic strategies. Neurobiol Learn Mem 96: 553-563. 27. Elgamal S, Denburg S, Marriott M, MacQueen G (2010) Clinical factors that predict cognitive function in patients with major depression. Can J Psychiatry 55: 653-661. 28. Rose EJ, Ebmeier KP (2006) Pattern of impaired working memory during major depression. J Affect Disord 90: 149-161. 29. Bearden CE, Glahn DC, Monkul ES, Barrett J, Najt P, et al. (2006) Patterns of memory impairment in bipolar disorder and unipolar major depression. 30. Preiss M, Kucerova H, Lukavsky J, Stepankova H, Sos P, et al. (2009) Cognitive deficits in the euthymic phase of unipolar depression. Psychiatry Res 169: 235-239. Persistent non-verbal memory impairment in remitted major depression – caused by encoding deficits? J Affect Disord 122: 144-148. 32. Reppermund S, Ising M, Lucae S, Zihl J (2009) Cognitive impairment in unipolar depression is persistent and non-specific: further evidence for the final common pathway disorder hypothesis. Psychol Med 39: 603-614. 33. Jaeger J, Berns S, Uzelac S, Davis-Conway S (2006) Neurocognitive deficits and disability in major depressive disorder. Psychiatry Res 145: 39-48. 34. Weisenbach SL, Boore LA, Kales HC (2012) Depression and cognitive impairment in older adults. Curr Psychiatry Rep 14: 280-288. 35. Patten SB, Wang JL, Williams JV, Currie S, Beck CA, et al. (2006) Descriptive epidemiology of major depression in Canada. Can J Psychiatry 51: 84-90. 36. Parikh SV, Lam RW; CANMAT Depression Work Group (2001) Clinical guidelines for the treatment of depressive disorders, I. Definitions, prevalence, and health burden. Can J Psychiatry 46 Suppl 1: 13S-20S. 37. Greer TL, Kurian BT, Trivedi MH (2010) Defining and measuring functional recovery from depression. CNS Drugs 24: 267-284.
improvement:assessing real-world outcomes in patients with major depressive disorder. Prim Care Companion J Clin Psychiatry 12. 39. Reesal RT, Lam RW; CANMAT Depression Work Group (2001) Clinical guidelines for the treatment of depressive disorders. II. Principles of management. Can J Psychiatry 46 Suppl 1: 21S-28S. Acute and longer-term outcomes in depressed outpatients requiring one or several treatment steps: a STAR*D report. Am J Psychiatry 163: 1905-1917. 41. Miller IW, Keitner GI, Schatzberg AF, Klein DN, Thase ME, et al. (1998) The treatment of chronic depression, part 3: psychosocial functioning before and after treatment with sertraline or imipramine. J Clin Psychiatry 59: 608-619. Determining severity subtypes of depression with a self-report questionnaire. 43. Montgomery SA, Asberg M (1979) A new depression scale designed to be sensitive to change. Br J Psychiatry 134: 382-389. 44. Hamilton M (1967) Development of a rating scale for primary depressive illness. Br J Soc Clin Psychol 6: 278-296. 45. Zimmerman M, McGlinchey JB, Posternak MA, Friedman M, Boerescu D, et al. (2008) Remission in depressed outpatients: more than just symptom resolution? J Psychiatr Res 42: 797-801.
patient’s perspective. Am J Psychiatry 163: 148-150. 47. McKnight PE, Kashdan TB (2009) The importance of functional impairment to mental health outcomes: a case for reassessing our goals in depression treatment research. Clin Psychol Rev 29: 243-259. 48. Daly EJ, Trivedi MH, Wisniewski SR, Nierenberg AA, Gaynes BN, et al. (2010) Health-related quality of life in depression: a STAR*D report. Ann Clin Psychiatry 22: 43-55. Factors associated with health-related quality of life among outpatients with major depressive disorder: a STAR*D report. J Clin Psychiatry 67: 185-195. 50. Zimmerman M, McGlinchey JB, Posternak MA, Friedman M, Boerescu D, et al. (2006) Discordance between self-reported symptom severity and psychosocial functioning ratings in depressed outpatients: implications for how remission from depression should be defined. Psychiatry Res 141: 185-191. Canadian Network for Mood and Anxiety Treatments (CANMAT) clinical guidelines for the management of major depressive disorder in adults. III. Pharmacotherapy. J Affect Disord 117 Suppl 1: S26-43. 52. Wade A, Gembert K, Florea I (2007) A comparative study of the efficacy of acute and continuation treatment with escitalopram versus duloxetine in patients with major depressive disorder. Curr Med Res Opin 23: 1605-1614. 53. Liebowitz MR, Manley AL, Padmanabhan SK, Ganguly R, Tummala R, et al. 54. Wise TN, Meyers AL, Desaiah D, Mallinckrodt CH, Robinson MJ, et al. 2 trials. Prim Care Companion J Clin Psychiatry 10: 270-275. 55. Simon GE, Von Korff M, Lin E (2005) Clinical and functional outcomes of depression treatment in patients with and without chronic medical illness. Antidepressants recruit new neurons to improve stress response regulation. Affect Disord 117 Suppl 1: S15-25. 58. March J, Silva S, Petrycki S, Curry J, Wells K, et al. (2004) Fluoxetine, cognitivebehavioral therapy, and their combination for adolescents with depression: Treatment for Adolescents With Depression Study (TADS) randomized controlled trial. JAMA 292: 807-820. 59. Cuijpers P, Dekker J, Hollon SD, Andersson G (2009) Adding psychotherapy to pharmacotherapy in the treatment of depressive disorders in adults: a metaanalysis. J Clin Psychiatry 70: 1219-1229. 60. Cuijpers P, van Straten A, Schuurmans J, van Oppen P, Hollon SD, et al. (2010) Psychotherapy for chronic major depression and dysthymia: a metaanalysis. Clin Psychol Rev 30: 51-62. 61. Gould RL, Coulson MC, Howard RJ (2012) Cognitive behavioural therapy for depression in older people: a meta-analysis and meta-regression of randomized controlled trials. J Am Geriatr Soc. 60:1817-1830. Clinical effectiveness of individual cognitive behavioral therapy for depressed older people in primary care: a randomized controlled trial. Arch Gen Psychiatry 66: 1332-1340. Effectiveness of a novel integrative online treatment for depression (Deprexis): randomized controlled trial. J Med Internet Res 11: e15. 64. DeRubeis RJ, Siegle GJ, Hollon SD (2008) Cognitive therapy versus medication for depression: treatment outcomes and neural mechanisms. Nat Rev Neurosci 9: 788-796. 65. Pampallona S, Bollini P, Tibaldi G, Kupelnick B, Munizza C (2004) Combined pharmacotherapy and psychological treatment for depression: a systematic review. Arch Gen Psychiatry 61: 714-719. 66. van Aalderen JR, Donders AR, Giommi F, Spinhoven P, Barendregt HP, et al. (2012) The efficacy of mindfulness-based cognitive therapy in recurrent depressed patients with and without a current depressive episode: a randomized controlled trial. Psychol Med 42: 989-1001. Antidepressant monotherapy vs sequential pharmacotherapy and mindfulnessbased cognitive therapy, or placebo, for relapse prophylaxis in recurrent depression. Arch Gen Psychiatry 67: 1256-1264. 69. May J (2011) What is integrative health? BMJ 343: d4372. 70. Kessler RC, Soukup J, Davis RB, Foster DF, Wilkey SA, et al. (2001) The use of complementary and alternative therapies to treat anxiety and depression in the United States. Am J Psychiatry 158: 289-294. 71. Wu P, Fuller C, Liu X, Lee HC, Fan B, et al. (2007) Use of complementary and alternative medicine among women with depression: results of a national survey. Psychiatr Serv 58: 349-356. 72. Javnbakht M, Hejazi Kenari R, Ghasemi M (2009) Effects of yoga on depression and anxiety of women. Complement Ther Clin Pract 15: 102-104. 73. Manocha R, Black D, Sarris J, Stough C (2011) A randomized, controlled trial of meditation for work stress, anxiety and depressed mood in full-time workers. Evid Based Complement Alternat Med 2011: 960583. 74. He SB, Tang WG, Tang WJ, Kao XL, Zhang CG, et al. (2012) Exercise intervention may prevent depression. Int J Sports Med 33: 525-530. 75. Liu W, Xu Y, Lu J, Zhang Y, Sheng H, et al. (2012) Swimming exercise ameliorates depression-like behaviors induced by prenatal exposure to glucocorticoids in rats. Neurosci Lett 524: 119-123. 76. Streeter CC, Gerbarg PL, Saper RB, Ciraulo DA, Brown RP (2012) Effects of yoga on the autonomic nervous system, gamma-aminobutyric-acid, and allostasis in epilepsy, depression, and post-traumatic stress disorder. Med Hypotheses 78: 571-579. 77. Harris AH, Cronkite R, Moos R (2006) Physical activity, exercise coping, and depression in a 10-year cohort study of depressed patients. J Affect Disord 93: 79-85. 78. Tsatsoulis A, Fountoulakis S (2006) The protective role of exercise on stress system dysregulation and comorbidities. Ann N Y Acad Sci 1083: 196-213. 79. Salmon P (2001) Effects of physical exercise on anxiety, depression, and sensitivity to stress: a unifying theory. Clin Psychol Rev 21: 33-61. 80. Lavretsky H, Alstein LL, Olmstead RE, Ercoli LM, Riparetti-Brown M, et al. (2011) Complementary use of tai chi chih augments escitalopram treatment of geriatric depression: a randomized controlled trial. Am J Geriatr Psychiatry 19: 839-850. 81. Lavretsky H, Epel ES, Siddarth P, Nazarian N, Cyr NS, et al. (2013) A pilot study of yogic meditation for family dementia caregivers with depressive symptoms: effects on mental health, cognition, and telomerase activity. Int J Geriatr Psychiatry 28: 57-65. Canadian Network for Mood and Anxiety Treatments (CANMAT) Clinical guidelines for the management of major depressive disorder in adults. V. Complementary and alternative medicine treatments. J Affect Disord 117 Suppl 1: S54-64. 83. Sharma VK, Das S, Mondal S, Goswampi U, Gandhi A (2005) Effect of Sahaj Yoga on depressive disorders. Indian J Physiol Pharmacol 49: 462-468. 84. Shahidi M, Mojtahed A, Modabbernia A, Mojtahed M, Shafiabady A, et al. (2011) Laughter yoga versus group exercise program in elderly depressed women: a randomized controlled trial. Int J Geriatr Psychiatry 26: 322-327. 85. Brown RP and Gerbarg PL (2005) Sudarshan Kriya yogic breathing in the treatment of stress, anxiety, and depression: part I-neurophysiologic model. J Altern Complement Med 11:189-201. 86. Srivastava M, Talukdar U, Lahan V (2011) Meditation for the management of adjustment disorder anxiety and depression. Complement Ther Clin Pract 17: 241-245. 87. Miller JJ, Fletcher K, Kabat-Zinn J (1995) Three-year follow-up and clinical implications of a mindfulness meditation-based stress reduction intervention in the treatment of anxiety disorders. Gen Hosp Psychiatry 17: 192-200.
anatomy of meditation practitioners: alterations in cortical gyrification. Front Hum Neurosci 6: 34. 89. Phillips LL, Paukert AL, Stanley MA, Kunik ME (2009) Incorporating religion and spirituality to improve care for anxiety and depression in older adults. Geriatrics 64: 15-18. Religiosity and major depression in adults at high risk: a ten-year prospective study. Am J Psychiatry 169: 89-94. Centering prayer for women receiving chemotherapy for recurrent ovarian cancer: a pilot study. Oncol Nurs Forum 36: 421-428. 95. Lawlor DA, Hopker SW (2001) The effectiveness of exercise as an intervention in the management of depression: systematic review and meta-regression analysis of randomised controlled trials. BMJ 322: 763-767. 96. Rimer J, Dwan D, Lawlor DA, Greig CA, McMurdo M, et al. (2012) Exercise for depression. Cochrane Database Syst Rev 7: CD004366. 97. Bridle C, Spanjers K, Patel S, Atherton NM, Lamb SE (2012) Effect of exercise on depression severity in older people: systematic review and meta-analysis of randomised controlled trials. Br J Psychiatry 201: 180-185. 98. Blumenthal JA, Babyak MA, O’Connor C, Keteyian S, Landzberg J, et al. (2012) Effects of exercise training on depressive symptoms in patients with chronic heart failure: the HF-ACTION randomized trial. JAMA 308: 465-474. 99. Blumenthal JA, Babyak MA, Doraiswamy PM, Watkins L, Hoffman BM, et al. (2007) Exercise and pharmacotherapy in the treatment of major depressive disorder. Psychosom Med 69: 587-596. Prognostic Benefits of Exercise and Antidepressant Therapy) study. J Am Coll Cardiol 60: 1053-1063. A randomised, controlled study on the effects of a short-term endurance training programme in patients with major depression. Br J Sports Med 41: 29-33. Effects of exercise on depressive symptoms in older adults with poorly responsive depressive disorder: randomised controlled trial. Br J Psychiatry 180: 411-415. 103. Trivedi MH, Greer TL, Grannemann BD, Chambliss HO, Jordan AN (2006b) Exercise as an augmentation strategy for treatment of major depression. J Psychiatr Pract 12: 205-213. 104. Krogh J, Saltin B, Gluud C, Nordentoft M (2009) The DEMO trial: a randomized, parallel-group, observer-blinded clinical trial of strength versus aerobic versus relaxation training for patients with mild to moderate depression. J Clin Psychiatry 70: 790-800. 105. McMartin SE, Jacka FN, Colman I (2013) The association between fruit and vegetable consumption and mental health disorders: evidence from five waves of a national survey of Canadians. Prev Med 56: 225-230. 106. Payne ME, Steck SE, George RR, Steffens DC (2012) Fruit, vegetable, and antioxidant intakes are lower in older adults with depression. J Acad Nutr Diet 112: 2022-2027. 107. Davison KM, Kaplan BJ (2012) Nutrient intakes are correlated with overall psychiatric functioning in adults with mood disorders. Can J Psychiatry 57: 85-92. F, et al. (2009) Association of the Mediterranean dietary pattern with the incidence of depression: the Seguimiento Universidad de Navarra/University of Navarra follow-up (SUN) cohort. Arch Gen Psychiatry 66: 1090-1098. 109. Akbaraly TN, Brunner EJ, Ferrie JE, Marmot MG, Kivimaki M, et al. (2009) Dietary pattern and depressive symptoms in middle age. Br J Psychiatry 195: 408-413. 110. Sánchez-Villegas A, Galbete C, Martinez-González MA, Martinez JA, Razquin C, et al. (2011) The effect of the Mediterranean diet on plasma brain-derived neurotrophic factor (BDNF) levels: the PREDIMED-NAVARRA randomized trial. Nutr Neurosci 14: 195-201. 111. Sanchez-Villegas A, Martinez-Gonzalez MA, Estruch R, Salas-Salvado J, Corella D, et al. (2013) Mediterranean dietary pattern and depression: the PREDIMED randomized trial. BMC Med 11: 208. 112. Peet M, Horrobin DF (2002) A dose-ranging study of the effects of ethyleicosapentaenoate in patients with ongoing depression despite apparently adequate treatment with standard drugs. Arch Gen Psychiatry 59: 913-919. 113. Nemets B, Stahl Z, Belmaker RH (2002) Addition of omega-3 fatty acid to maintenance medication treatment for recurrent unipolar depressive disorder. Am J Psychiatry 159: 477-479. 114. Lespérance F, Frasure-Smith N, St-André E, Turecki G, Lespérance P, et al. (2011) The efficacy of omega-3 supplementation for major depression: a randomized controlled trial. J Clin Psychiatry 72: 1054-1062. SB, et al. (2009) A double-blind, randomized controlled trial of ethyleicosapentaenoate for major depressive disorder. J Clin Psychiatry 70: 1636 1644. 116. Linde K, Berner M, Egger M, Mulrow C (2005) St John’s wort for depression: meta-analysis of randomised controlled trials. Br J Psychiatry 186: 99-107. 117. Linde K, Berner MM, Kriston L (2008) St John’s wort for major depression. Cochrane Database Syst Rev : CD000448. 118. Whiskey E, Werneke U, Taylor D (2001) A systematic review and metaanalysis of Hypericum perforatum in depression: a comprehensive clinical review. Int Clin Psychopharmacol 16: 239-252. 119. Martins JG (2009) EPA but not DHA appears to be responsible for the efficacy of omega-3 long chain polyunsaturated fatty acid supplementation in depression: evidence from a meta-analysis of randomized controlled trials. J Am Coll Nutr 28: 525-542. 120. Sublette ME, Ellis SP, Geant AL, Mann JJ (2011) Meta-analysis of the effects of eicosapentaenoic acid (EPA) in clinical trials in depression. J Clin Psychiatry 72: 1577-1584. L-methylfolate as adjunctive therapy for SSRI-resistant major depression: results of two randomized, double-blind, parallel-sequential trials. Am J Psychiatry 169: 1267-1274. Therapeutic effects of vitamin D as adjunctive therapy to fluoxetine in patients with major depressive disorder. Aust N Z J Psychiatry 47: 271-275. 123. Bertone-Johnson ER, Powers SI, Spangler L, Larson J, Michael YL, et al. (2012) Vitamin D supplementation and depression in the women’s health initiative calcium and vitamin D trial. Am J Epidemiol 176: 1-13. 124. Harris E, Kirk J, Rowsell R, Vitetta L, Sali A, et al. (2011) The effect of multivitamin supplementation on mood and stress in healthy older men. Hum Psychopharmacol 26: 560-567. 125. Long SJ, Benton D (2013) Effects of vitamin and mineral supplementation on stress, mild psychiatric symptoms, and mood in nonclinical samples: a metaanalysis. Psychosom Med 75: 144-153. 126. Rosenquist JN, Fowler JH, Christakis NA (2011) Social network determinants of depression. Mol Psychiatry 16: 273-281. 128. Zlotnick C, Shea MT, Pilkonis PA, Elkin I, Ryan C (1996) Gender, type of treatment, dysfunctional attitudes, social support, life events, and depressive symptoms over naturalistic follow-up. Am J Psychiatry 153: 1021-1027. 129. Kuehner C, Huffziger S (2013) Factors predicting the long-term illness course in a cohort of depressed inpatients. Eur Arch Psychiatry Clin Neurosci 263: 413-423.
increases social connectedness. Emotion 8: 720-724. 131. Siskind D, Harris M, Pirkis J, Whiteford H (2012) Personalised support delivered by support workers for people with severe and persistent mental illness: a systematic review of patient outcomes. Epidemiol Psychiatr Sci 21: 97-110. 132. Griffiths KM, Crisp D, Christensen H, Mackinnon AJ, Bennett K (2010) The ANU WellBeing study: a protocol for a quasi-factorial randomised controlled trial of the effectiveness of an Internet support group and an automated Internet intervention for depression. BMC Psychiatry 10: 20. 133. Bolier L, Haverman M, Westerhof GJ, Riper H, Smit F, et al. (2013) Positive psychology interventions: a meta-analysis of randomized controlled studies. BMC Public Health 13: 119. 134. Cheng MK (2007) New approaches for creating the therapeutic alliance: solution-focused interviewing, motivational interviewing, and the medication interest model. Psychiatr Clin North Am 30: 157-166. 135. Mintz DL, Flynn DF (2012) How (not what) to prescribe: nonpharmacologic aspects of psychopharmacology. Psychiatr Clin North Am 35: 143-163. Primary care patients’ involvement in decision-making is associated with improvement in depression. Med Care 44: 398-405. 137. Loh A, Simon D, Wills CE, Kriston L, Niebling W, et al. (2007) The effects of a shared decision-making intervention in primary care of depression: a clusterrandomized controlled trial. Patient Educ Couns 67: 324-332. 138. Morrell CJ, Warner R, Slade P, Dixon S, Walters S, et al. (2009) Psychological interventions for postnatal depression: cluster randomised trial and economic evaluation. The PoNDER trial. Health Technol Assess 13: iii-iv, xi-xiii, 1-153. Comparative effectiveness of standard versus patient-centered collaborative care interventions for depression among African Americans in primary care settings: the BRIDGE Study. Health Serv Res 48: 150-174. 140. Jani B, Bikker AP, Higgins M, Fitzpatrick B, Little P, et al. (2012) Patient centredness and the outcome of primary care consultations with patients with depression in areas of high and low socioeconomic deprivation. Br J Gen Pract 62: e576-581. 141. Craven MA, Bland R (2006) Better practices in collaborative mental health care: an analysis of the evidence base. Can J Psychiatry 51: 7S-72S.